Neami in South Australia runs a vibrant arts program that supports consumers to produce, exhibit and sell their artwork. As part of the Adelaide Festival of Ideas the Kerry Packer Civic Gallery at The University of South Australia is hosting an exhibition featuring works made by eight artists who attend the arts programs. Throw the Dice opened on Thursday 20th. The exhibition features a diverse range of artworks by local emerging artists by Joe Amuso, Stevan Hewison, Leon Kassel, Ingrid De Ruyter, D.Line, Catherine Pallin, Phillip Miller and Pamela Smith. These artists attended the various art programs in South Australian. “It was so great to see such a wonderful turn out and mixture of people at the opening. 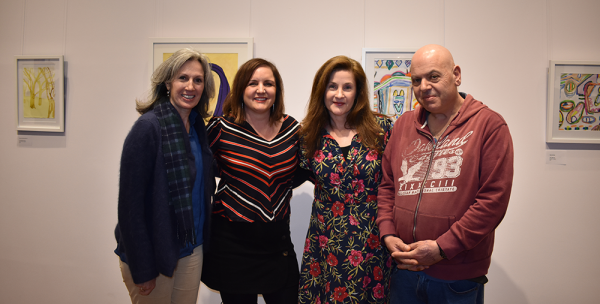 Thank you to the Kerry Packer Civic Gallery and Neami for support all the artists involved, it was a wonderful experience.“ said Catherine Pallin. “This exhibition is an important step for Neami and our artists as it reaches a broader audience and validates the importance art plays in a person’s recovery whilst also advocating for more diversity in the arts,” said Vass Hay, Arts Coordinator. Throw the Dice runs till Wednesday 1 August.